Why usual yum? 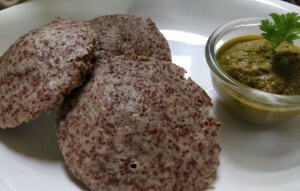 Have you tried millet Idli? Idlis are one of the most popular south Indian breakfast. It’s healthy, tasty easy to cook recipe. Generally, idlis are made of urad dal and rice. Let us go out of this zone and try this particular dish by using millets. Millet’s is one of the healthiest ingredients. Soak all the ingredients together for 8 hours, grind them together in a mixer with enough water, until Idly batter consistency. Keep the batter for 6 to 8 hrs fermentation and post-fermentation gently apply little oil on the Idly maker plate and steam them for 8 to 12 minutes. Serve hot with chutney or sambar ! !